Kingsley joined StreetSquash Newark in 2017. He graduated from St. Lawrence University in May 2017 with a BA in Global Studies and a minor in Spanish. While at St. Lawrence, Kingsley competed on the varsity squash team for all four years. 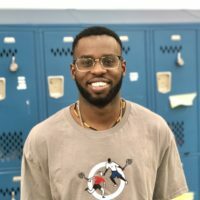 Before joining StreetSquash Newark, Kingsley served as a summer intern at US Squash, and a summer staff member at StreetSquash Harlem. Kingsley is a proud CitySquash Alum (’13).